On 10 July, one Ph.D. student and seven Master’s students graduated with degrees from UNU-IAS. This year’s eight graduates come from Ethiopia, France, India, Mexico, Myanmar, Sri Lanka, and Zimbabwe. 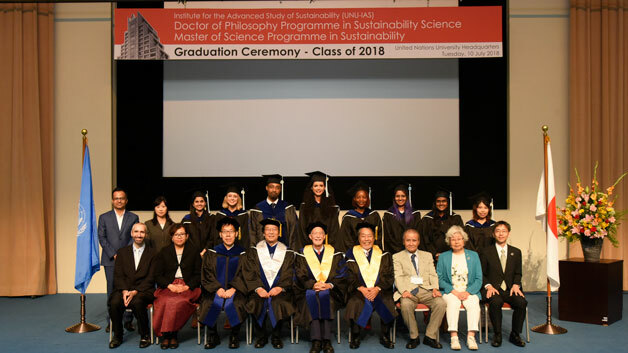 At the graduation ceremony, UNU Rector David M. Malone and UNU-IAS Director Kazuhiko Takemoto delivered remarks to the graduates and assembled guests, followed by a special lecture from Yoshifumi Yasuoka, Professor Emeritus of the University of Tokyo. Academic Director Osamu Saito gave a brief report on the PhD and MSc Programmes. Two of the new graduates, Sileshi Degefa Geleto and Tamara Alina Luisce Parroquin, also gave speeches on behalf of the 2018 graduates. UNU-IAS congratulates the graduates on their achievements and looks forward to hearing about their future endeavours.